A luxury and intense 100% chocolate bar created by the renowned maker Akesson’s. This 100% Criollo bar is both an exceptional and rare example of terroir. To put it into context, this estate produces 300 tons of Trinitario cocoa every year, but only 2 tons of Criollo beans are available to be harvested separately to make this bar, a very limited supply. In 2018, these Åkesson’s Criollo beans were awarded Heirloom Cacao Preservation (HCP) status. Bertil Åkesson is one of the true heroes of the bean to bar market, pioneering the direct sale of his single estate beans to over three hundred chocolate makers all over the world. Born to a Swedish diplomat father and a French mother, Bertil grew up in Madagascar, where his family settled in the 1970s. There, his father established a number of cocoa and spice plantations which Bertil has expanded. Bertil also crafts his own bars. Today, bars made with his beans have won a long list of accolades and prizes all over the world, not least this lively and expressive single-origin bar. Awards for this bar include gold at the Great Taste awards, the European Chocolate Awards and the Academy of Chocolate Awards. 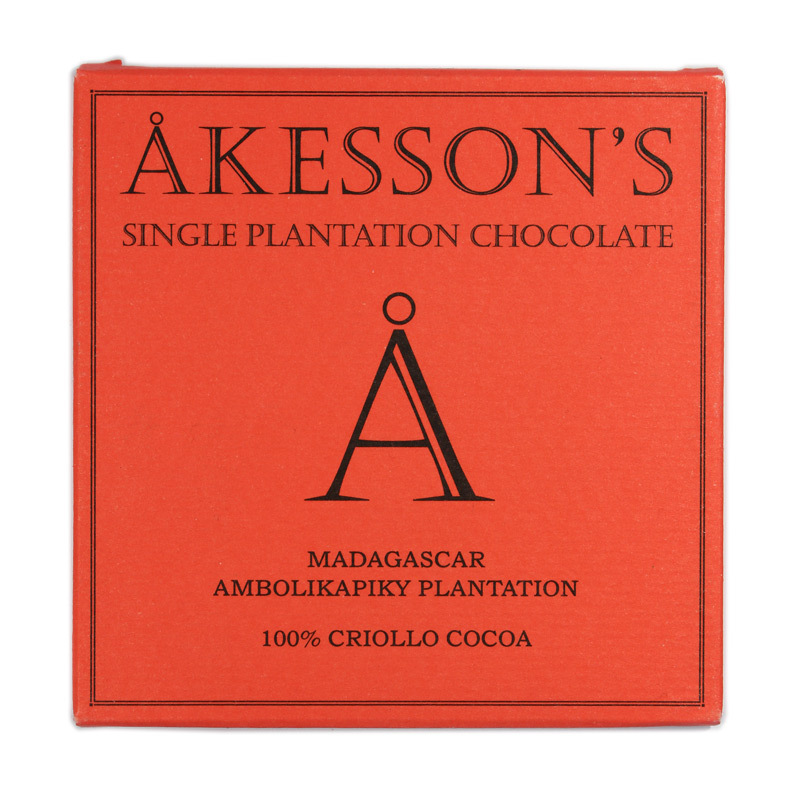 This bar hails from Åkesson’s Ambolikapiky plantation in the celebrated cacao producing region of the Sambirano Valley, North-West of Madagascar, with many of the world’s best chocolate makers and chefs using cocoa from this estate. A solid 100% chocolate comparable to Chocolat Madagascar or Pralus in terms of its texture and fruity acidic taste notes. A very pleasant and creamy 100% bar, although I found it less fruity than Pralus Le 100%. Anyway, both bars together with Domori Il 100% are definitely the type of pure cocoa bars I like.